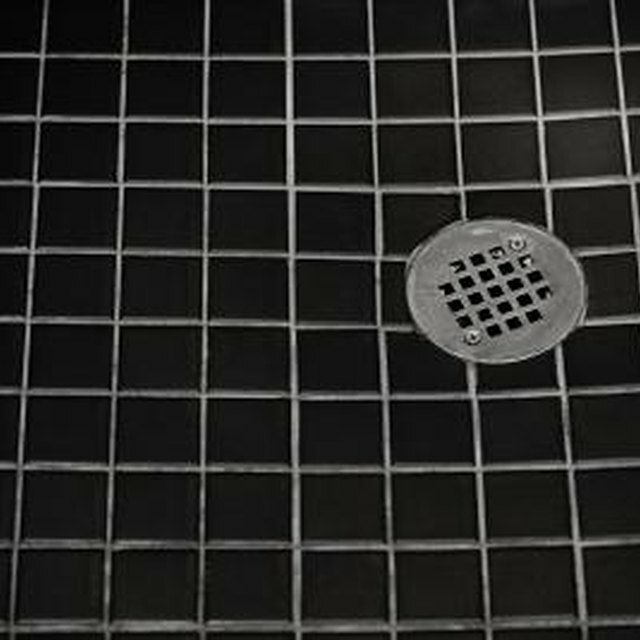 You see a shower's drain piece from the top every time you take a shower, with a cover that has grates to prevent objects from falling down the drain. The drain assembly extends down through the shower pan, or the shower floor, and into the drainpipe that sits just below the shower pan. Shower drain kits come with the drain body, the cover, screws and a rubber gasket, and some also include a washer and retaining nut. The rubber gasket, washer and retaining nut help achieve a watertight seal without using caulk. You do not need to use caulk to seal a new shower drain. Place the shower drain in the opening in the shower pan, ensuring it fits properly in the drainpipe below the shower pan. Remove the drain piece from the pan and insert your fingers into the hole. Move the drainpipe over about an inch by hand. Slide the gasket, and nut or washer if included with the drain kit, into position between the drainpipe and the bottom of the shower pan. Brush an even coat of PVC primer then PVC cement onto the inside of the drainpipe and the outside of the bottom of the drain assembly. Insert the drain assembly back through the hole in the shower pan and into the drainpipe. Pound the top of the drain assembly with a rubber mallet until it sits flush with the shower floor. Position the drain cover and drive the screws through the cover to anchor it in place.